Rugged and breathtaking. Terrifying yet calming. Mysterious and magical. Situated atop one of its highest knolls, the historic Heceta Head Light Keepers house on the Oregon coast induces all these emotions and more. Location, location, location. The ample front porch is the perfect spot to sit with a glass of Oregon pinot noir, listening to the songs of the sea lions mingling with the roar of the surf crashing far below. Fishing boats float on the horizon. The intermittent spout of a gray whale interrupts the flow. You’ll be swept away from reality by the ever-present rotating beacon from the lighthouse. 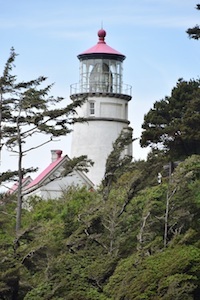 This is the lure of the historic Heceta Head Lighthouse Bed and Breakfast — this, and breakfast. From 1894 to 1963 there were 35 keepers stationed at Heceta (pronounced Ha-SEE-Ta) Head. In 1978 it was placed on the National Register of Historic Places. Now owned by the National Park Service, the Queen Anne style Victorian home of the original family of light keepers has been painstakingly restored to its original condition, with modern luxuries for the discerning traveler. Two parlors with cozy fireplaces, each furnished with an antique velvet couch and period tables and lamps, invite reading and playing games. While you are relaxing, you might want to read a story about the resident ghost, Rue, or peruse the Cook Book, for a look-see at what might be on the breakfast table in the morning. Up the narrow winding staircase, your room is ready. Warm, comforting surroundings set the mood: romantic fourposter beds with eiderdown duvets, fluffy pillows, lace curtains, porcelain claw-foot tubs, and marble showers. Romance and history. Don’t get too comfortable yet. After dark, grab the flashlight from the desk and walk up the path to the brightest lighthouse on the coast. Overhead, the carousel of light circles, mesmerizing, never-ending. Once every 10 seconds, the white flash from the eight-prismed Fresnel lens brings comfort to seafarers traveling up and down the coast, as it has done for over a century. Morning brings the sunshine, often the Oregon liquid type, pouring in. Never mind, breakfast promises to put a smile on even the crankiest face. The seven-course gourmet meal begins with the ringing of the captain’s bell, inviting guests into the elegant dining room set with vintage art deco dinnerware. Start with a Pinot Gris Cocktail, not the imbibing variety, but cantaloupe, strawberries, pears, and watermelon in pinot gris syrup topped with mascarpone cream and candied hazelnuts. Heceta Head crab cakes are prepared with fresh Dungeness crab topped with a caper remoulade. Blueberry, citrus, and white chocolate frappe cleanses the palate. You’re not even halfway through breakfast at this point, but you get the picture. Each dish is a feast fit for a king. 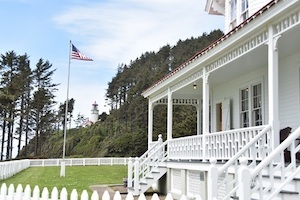 Although breakfast is more decadent than vintage, the Heceta Head Lighthouse Bed and Breakfast is a refreshing blend of American history, culinary complexity, and Oregon coast grandeur.